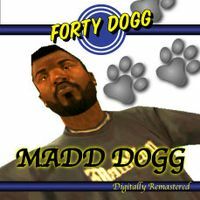 Forty Dogg is an album released by Madd Dogg, and presumably his manager Carl Johnson, in 1993. The album covered a number of his personal issues, including his failed relationship with Rochell'le, his alcoholism (as seen during Madd Dogg) and drug-use (Madd N A Haze). The album was later remastered in 2003 and reviewed by Big Smilky on the Forgotten Legends of West Coast Rap website (website no longer active). If Madd Dogg was mad on "Still Madd," then "Forty Dogg" could have been titled, "Even Madder Than on Still Madd." Fueled by the turmoil in his personal life (failed relationship with Rochell'le, defecting Doggy Boyz, and mounting debt), "Forty Dogg" forged new ground for Madd Dogg, as he explored a range of topics, from the pleasures of drunkenness ("Funkin' Forties") to the mind-opening benefits of weed ("Madd N A Haze"). The rest of the West quickly followed suit. This was his last great album, followed by the less-than-stellar "N.L.A.D.B. (Never Leave a Dog Behind)" in 1994. "Forty Dogg" was digitally remastered in 2003, to the delight of many fans. This page was last modified on 14 October 2014, at 23:37.